I haven't written a proper book report in a while, so today is a good day to give that muscle some exercise. The book consists of three main parts, each of them dedicated to sugar, fat and salt. First, it talks about the research that goes into the manufacturing of processed foods. The book explains some core concepts, such as "bliss point", and how they affect the food content. It also explores how the three ingredients interact with each other to enhance flavor. The first part investigates the nature of people's cravings for sweet foods. It also talks about the history of cereal and sweet drinks, such as soda and juices, as well as the success of carefully crafted advertising in boosting sales. The second part talks about the fat content of processed meat, milk and cheese. It follows the struggle of Oskar Meyer to keep the sales up, culminating in the invention of the Lunchables. It also talks about the role of the US government in understating the health risks associated with fat. The final part exposes how much salt is used to make processed food. It also talks about the industry's dependence on salt to mask undesirable flavors, such as that of reheated meat, also known as warmed-over flavor. Each of the parts talks about health concerns associated with the three ingredients, and about the steps taken to mitigate them. Several examples of "light" versions illustrate how challenging it is to modify the recipe without making the taste bad. The book also tracks the lives of several key researchers and executives of the processed food manufacturing companies, and how those people's attitudes towards what they were making have changed over time. It concludes by saying that the best we can do as customers is to pay close attention to the labels and make educated choices. I have always had the nagging suspicion that most of the food items sold at the supermarket aren't healthy. I was glad to see such compelling confirmation in Michael Moss' book. For example, a lot of the cereals have so much sugar in them that they can hardly be called "healthy", but the manufacturers aren't required to put the sugar percentage on the package. After reading the book, I went to the grocery store and calculated what percentage of a serving is sugar for several kinds of cereal. I was heartened to know that my favorite cereal is only 13% sugar, unlike some others that are full 35%. The book cites a lot of interesting numbers regarding per-capita consumption of certain foods, such as processed cheese. It also talks about cheese being marketed as an ingredient, so that people use it when they cook, which is quite brilliant on the part of those sales people. Another interesting thing that I learned is that while people can get strong cravings for salt, those are not innate, and also they can be reversed by lowering salt consumption. I also didn't know that our bodies are really bad at detecting calories in liquid foods, making it really easy to overeat. Overall, I think this book was well worth reading. Even though I do my best to eat healthy food, some of the facts were still eye-opening to me. 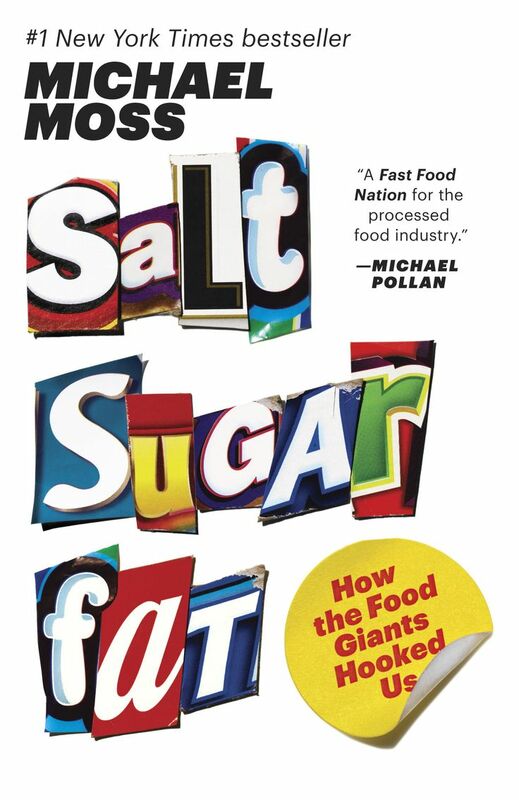 If you would like to read this book as well, here is a handy link to Amazon: Salt Sugar Fat: How the Food Giants Hooked Us .